One of the well-known shopping street in Singapore. The narrow lane is decked up with vintage boutiques and stores selling reasonably priced items. The road is full of murals and interesting candy-colored outlets. The bustling 2.2 Km boulevard derived its name after pepper plantations from 1800. Both sides of the street are flanked with tiny boutiques, hotels, offices, spa, departmental stores, entertainment spots, cafes and restaurants. There is never a dull moment as some kind of fair being organics in malls and the changing skyline leaves you amazed. The world full of India’s treasure of art, antiques, food, textile and music including Mustafa Departmental store is a unique experience itself. Computer lovers will find something within budget in Sim Lim Square while expert bargainers can good deals with electronic items. Of course, it wouldn’t be Little India without rows of delicious Indian curry houses. 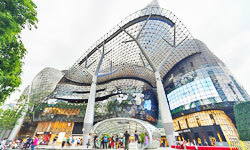 The largest shopping mall that would lure the city’s crowd from the craziness of Orchard Road. A pleasant space to shop with a lot of space including rooftop sky park and kids playground. Once you are done with the shopping, rush to the range of bars or restaurants to sit and soak the sea breeze. One of the wallet-friendly place for shopping if you are looking for trendy and quirky stuff. One thing Bugis Street is known for its pop culture themes fashion goods like Japanese, Korean-inspired stuff. Once hopping from one stall to other leave you puckish, gran octopus balls, Taiwanese hot dog to satisfy your hunger. Located on the south-west of Singapore recently has boomed into a shopping area with bars and high-end restaurants. You will find Shang Antique – specialises in South-east Asian Antiques, few of them are around 2000 years old. You can also explore an array of nightlife options and swanky dining around Dempsey Hill. No doubt the island is the paradise for shopping lovers and shopping can’t get any better than here.